The Mistraal Drum Fan is a true directional airflow fan which provides maximum greenhouse air movement. 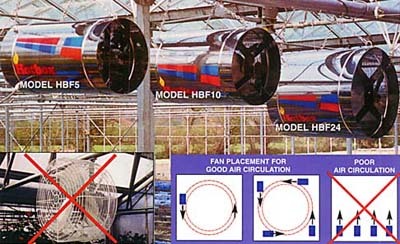 Unlike regular open cage fans which tend to move the air in a “ball”-shaped flow around the fan, Mistraal Drum Fans (which are set inside a stainless steel drum) force the air down the greenhouse. Mistraal Drum Fans improve heat distribution and reduce temperature gradients. For larger areas use 8 fans per acre. NOTE: Fans should be installed at a maximum 2.4 metres from the floor. 100 m2 1200 sq. ft.
200 m2 2300 sq. ft.
500 m2 5500 sq. ft.